By the late 1990s, I had all but given up hope of ever knowing the true backstory of the mysterious and much discussed Space Jockey from Ridley Scott's original 1979 masterwork Alien. His fossilzed remains were doomed to remain in the pilot seat of the derelict spacecraft without proper fleshing out or explanation while Hollywood churned out sequel after sequel. Well, it turned out I should have kept the faith that someday Ridley Scott would return to this dark corner of the universe to answer my burning questions and quench my thirst for summertime science fiction. 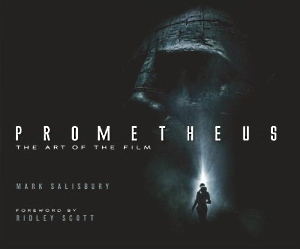 After seeing Prometheus, I admit that I may have actually come away with more things to analyze and obsess over than I originally bargained for, so to help me muddle through I now have Mark Salisbury's book, Prometheus: The Art Of The Film. A gorgeous full-color look at the making of the film with a forward written by Ridley Scott himself and production stills that will stop you dead in your tracks, this is a must-have for anyone who ever counted themselves an Alien fan or collector. Filled with Scott's hand-drawn storyboards, eerie but beautiful set photos detailing every aspect of the shoot and production design process, you feel like you've stepped back into the unsettling world of a brutal creature. Visually, this book has the unexpected effect of drawing you in for hours to pour over the rich details, so I recommend giving yourself a few hours to really enjoy it. And while there is no going wrong with including deleted scenes or abandoned ideas that ended up on the cutting room floor, it did make me wonder why a few key elements seen in the book were tossed in the final edit. Still, this book is about the art of the film and even with all the unanswered questions buzzing in the back of my brain, I was able to understand and appreciate how the creatures of Ridley Scott's universe remain a topic of fierce wonder and awe.